From late June through the foliage season, there is a town information booth (tel 802-457-1042) in service on the village green, where you can get a free village map and list of town businesses. Otherwise, contact the Woodstock Area Chamber of Commerce, 4 Central St, Woodstock VT 05091 (tel 802-457-3555). 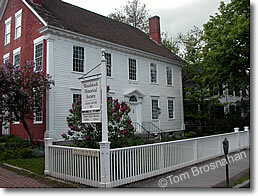 & information office, Woodstock, Vermont.